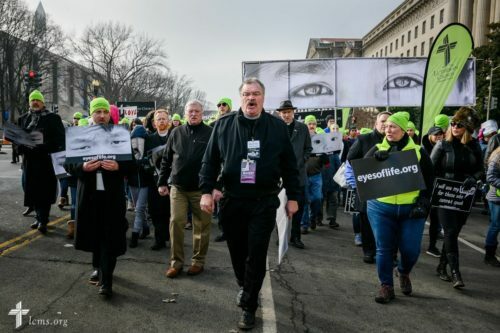 Life March 2019 | "Northern Crossings"
This is a picture of part of the LCMS delegation to the Life March in Washington D.C.. In front is the Rev. Matthew Harrison the LCMS President. To his left is the Rev Don Fondow President of the Minnesota North District LCMS. The LCMS has been a participant in the March for a long time and this year they report a larger number of young people and a generally larger crowd. We have been talking on this blog is what can happen when people change our language and the meaning of words and the effect it can have on theology and mercy and welfare and the care for the poor and needy. When one changes or allows to be changed the meaning of “life” and changes the age old concept of procreation, partnering and being with creation, to reproduction as if a child is simply a Xerox that can be erased or torn up, changes take place in the culture and society that is obviously not God pleasing or helpful to life or liberty or the pursuit of happiness. Marching may seem to be symbolic and it is but we need to see a counter to the messages and the publicity that challenge us everyday to forget God’s love of the “least”. We’re the Pence’s and we are pro-life. 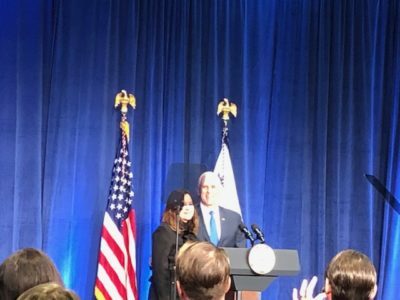 The speech at the Life March by Vice-President Pence was much appreciated. HIs wife has recently taken a job at a Christian School and of course she has been accused as being a “bigot”. Words mean things and how is it that suddenly working for a Christian School akes one a bigot? What does bigot mean and why is it used in this context? Thanks to all who went to the Life March and those who pray for those cannot speak and those who speak for those who have no voice. There was a Church here.